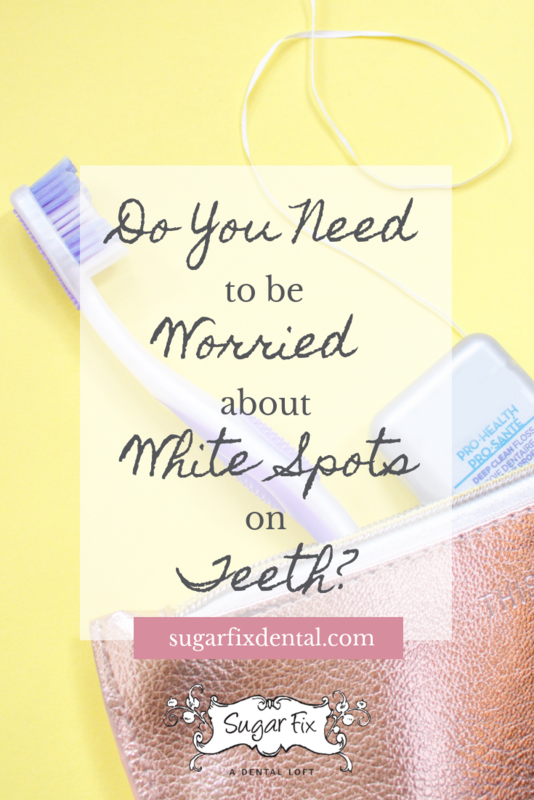 Do You Need to be Worried About White Spots On Teeth? This is a topic we wrote about on the blog back in 2015, and it’s been one of our most popular posts to date! It’s clear that people are wondering about whether white spots on teeth are dangerous or whether they’re harmless. Of course, it’s always a good idea to make an appointment with your dentist if there’s anything that’s concerning you, but hopefully this post will help clear up some of the mystery surrounding white spots on teeth! Many people have this issue, and generally, the white spots are due to a loss of minerals in the enamel of the tooth. Below are just some of the most common causes for this, and some tips for you to avoid any further issues! This is a biggie. While these white dehydration marks are not dangerous to your teeth, you should always try to stay well hydrated! This can help you avoid other health issues, and generally, it just makes you feel better throughout the day. Aside from drinking water throughout the day, it’s important to drink water as soon as you wake up. It helps to jumpstart saliva production and saliva is what keeps your teeth hydrated… like a glaze! Fluoride is really good for your teeth, but you can get too much of a good thing. Fluorosis is when you have too much fluoride. It’s very common in children, especially if they’re using too much toothpaste or swallowing it. If you notice white spots on your child’s teeth, this could be the reason. Monitor them while they brush and only use a pea-sized amount of toothpaste. If you notice this on your own teeth, you may want to switch to a fluoride-free toothpaste and see if that helps. When you don’t get enough calcium in your diet, you might start to notice “enamel hypoplasia” which is another word for white spots on teeth caused by nutritional deficits. Calcium is one of the major components to healthy teeth and bones. If you suffer from celiac disease, you might notice this more than those who do not have this issue because your body has a harder time absorbing certain nutrients. Talk to your dentist or your doctor if this is happening to you! We all have bacteria on our teeth. In addition to causing cavities, bacteria in your mouth can strip minerals from your teeth, causing white sports to appear. If the bacteria goes untreated, it could lead to more serious issues. Don’t forget to brush and floss daily to remove acidic bacteria from the surface of your teeth! Tetracycline is an antibiotic that has been used to treat certain medical conditions. One of the known side effects of this antibiotic is staining of the teeth. It isn’t prescribed much anymore, but children whose mothers took tetracycline while pregnant or had it prescribed to them at a young age may suffer from discoloration and white spots on their teeth. If you have white spots on your teeth that make you feel insecure or nervous, it’s time to set up an appointment with Dr. Emery at Sugar Fix Dental Loft. We can give you peace of mind and let you know whether the white spots can be reversed and how to do it. We want you to feel confident about your smile and be as healthy as possible! You can schedule an appointment on our website or give us a call at (773) 883-1818.